Need help with your handgunning? 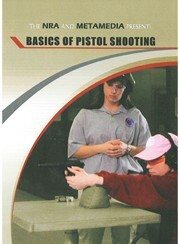 Check out the NRA’s Basics of Pistol Shooting DVD. This $19.95 DVD covers the purchase, handling, cleaning, and storage of both revolvers and semi-automatic pistols along with marksmanship fundamentals. Computer animations provide an inside look at how revolvers and semi-automatics function. The Basics of Pistol Shooting DVD is intended for anyone interested in learning how to safely operate, clean and select a pistol for a variety of activities. Produced as a training aid for NRA’s Basic Pistol and/or FIRST Steps Pistol Courses, the 60-minute DVD provides useful information for all handgun owners, not just novices. We also recommend that NRA Certified Pistol Instructors watch the DVD to familiarize themselves with the most current training methods and safety procedures. The DVD can be ordered through the NRA Program Materials Center or by calling 1-800-336-7402. Share the post "NRA Offers ‘Basics of Pistol Shooting’ DVD"